This topic contains 5 replies, has 5 voices, and was last updated by sumac.carol 6 months, 3 weeks ago. Nice to see Austria jail that SOB farmer; I’m a huge fanboy of bees, especially honey bees. Even here in Thailand, the Asian honey bees are very friendly and land on me all the time. Land on my hand and crawl around, no problem. I put out a water dish for them and they come to drink. The wild Asian honey bees are nomads; they nest for a year and move on. Most enjoyable fellows, friends to all. Of course that gentleman wiped out the hives, which would be worth $100? apiece? Less measurable, the loss to the fields that might have been pollinated, so although a year’s sentence seems excessive, suppose the overall loss adds up to $20,000 or more. That’s comparable to auto theft, a serious crime, so it’s not as far off as might first seem. As with other non-growers, they overstate honeybees. Although vital, they are animals of the Old World, not seen in the Americas. Meaning that the Indian crops; corn, beans, potatoes, tomatoes, tobacco, squash, were never pollinated by honeybees, but by their cousins, wasps, flies, and mason bees. However, most of the fruiting trees are of the old world and prefer their correct, historic pollinator. So although a wild improvement, and would be mortally irresponsible to harm as a species, the planet is wide and strong and could fall back to so many levels. 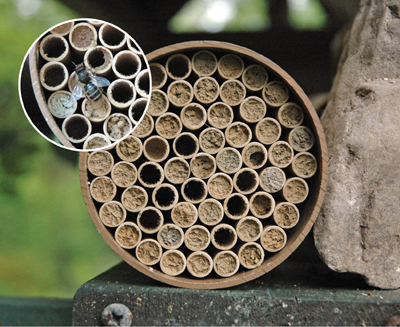 If you cannot keep a hive and would like a hobby, try setting out mason bee nests. Re the bees: there are about 2500 types of wild bees in North America and some of these are far more efficient pollinators than honey bees. Bee keeping has become an integral part of industrial agriculture. However non-native hone bees in North America out-compete the wild bees for food. If our agricultural practices created a steady food supply for wild bees (ie with different plants flowering throughout the growing season instead of having hundreds of hectares of one crop blooming all at once and then nothing for the rest of the time) wild bees would be all we would need. I know orchardists with a good mix of fruiting plants and these folks removed honey bee hives due to excess pollination. In our mixed fruit orchard we rely exclusively on wild bees and we plant a mix of wild flowers between our trees and shrubs- we have a beautiful variety of pollinators. Farmers are now being encouraged to interplant their crops with pollinator friendly plants. IMHO big ag bee keepers have done a great PR job that is perpetuating an unsustainable model.